Google Books (books.google.com) has huge listing of books of different topics and categories. 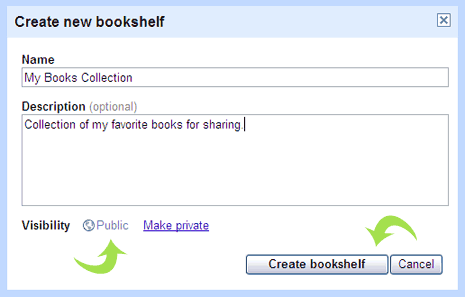 It has easy to use “bookshelf” feature that allows quick organizing and sharing of collection of books. You can create multiple bookshelfs as per requirement and share your bookshelfs with online friends for quick and easy recommendations of best books. 1. Goto http://books.google.com & login using your Google account. 2. Click ‘Create new bookshelf’ button at left sidebar. 3. Then enter ‘name’, ‘description’ for bookshelf (by default it is public). Newly created bookshelf is listed on the left menu. 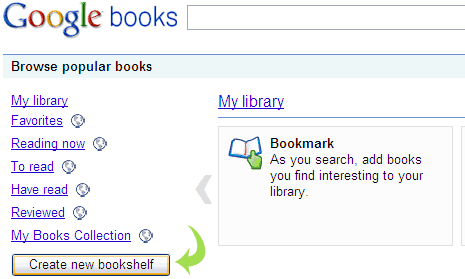 Open any specific Google book page, then click “Add to Bookshelves“. 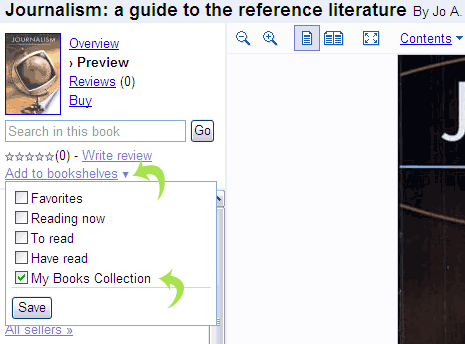 Click to tick your bookshelf name and then click Save button to put that Google book in a bookshelf. Click on Bookshelf name on the left to open your collection, then use URL at the top to directly share your bookshelves with your friends. Also, you can goto Options > Export as XML to share bookshelves by sending XML file.